This time, and to start 2008, it's not a real review It's just a collection of maps that were the subject for a partial work exam at the SMU Gildhall All level work of the student who have participated will be listed below. 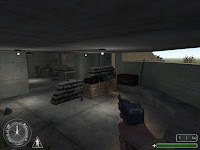 "Bunker is a Call of Duty level created in the level design class as one of our exams. 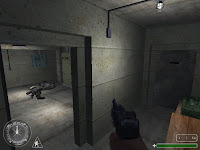 Our parameters were: The player would travel upwards through 3-4 rooms (not including hallways) and then escape the bunker and exit into a field. We were not allowed to use a script file, so that ruled out most interaction and smart AI. 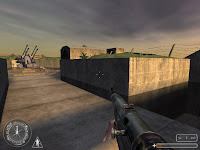 We had one week to create the entire level and populate it." 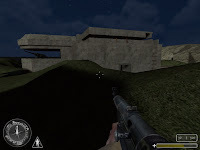 this one is certainly the hugest the team is for me not really linked to simply a bunker but is more massive and looks more like a Industrial base protected by a bunker. Design is for me classic with a correct layout but misses a better attention to detail. Gameplay is standard with no surpise (logic since it wasn't ask to be scripted) but produce a correct enjoyment for arround 15 minutes. Like the author explain this map was fastly build with for the time he spend a highly enjoyable layout through the color choice and the attention to detail. 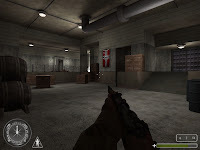 you will only visit a succession of 3 rooms nicely textured and fool of WW2 atmosphere. 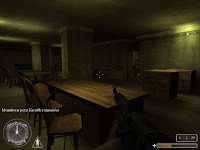 Gameplay is a simple seek and destroy progression enhance by the first room were you need to search for something...for arround 10 minutes of gameplay it's fairly enjoyable. In conclusion: not the shortest but for sure the best in atmosphere according the realisation of a bunker. The documentation that came with this one is impressive regarding the 2d sheet of this bunker; regarding the design of it, it's way more classic and even if the layout is correct this tiny realisation won't take you more than 5 minutes to be completed the outdoor layout is quite enjoyable and can be considered as a reward when you end you really short mission.